Lorna Green's love for filmmaking and story telling is grounded in her experiences as a youth in the projects of The Bronx. After finishing high school at the age of 15, Lorna earned her BA degree in psychology at Hamilton College. In college, she worked as a videographer, editor, and writer. Her MFA in Communication and Film at the University of New Orleans, LSU, was awarded "With Distinction." Lorna entered the working world with a hunger to direct. After a year with the Samuel Goldwyn Company in New York, she co-founded a New York-based production company. Young Brothers and Sisters Inc. provided resources for people of color to create their own images in visual media. At YBS, Lorna wrote and directed award-winning narrative shorts used widely by educators and youth advocates nationally and internationally. Lorna's portfolio includes a wide array of independent film and video work. 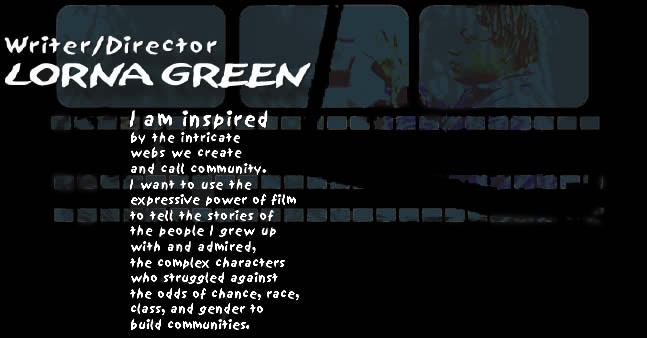 She's written several feature length screenplays, including Family Brown, Hard Edge, and The Black Seminoles. Her honors include several Gold and Silver CINDY Awards, the Gold Medal Questar Award, CINEs Golden Eagle, and an Honorable Mention at the Columbus International Film and Video Festival. Continuous since her graduate school days, Lorna maintains a disciplined schedule of writing her own screenplays while directing and editing industrials to pay the bills. Today she is in development of a screenplay entitled "Blanket Party," a gritty, hip-hop noir about revenge in the Bronx.